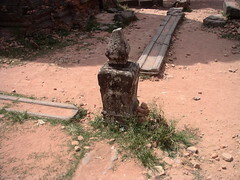 Originally there was a linga where this post now stands. There are four channels with spouts at the end to distribute the linga water more efficiently. Water and agriculture was a very important part of these people's lives. The king was revered as a god and he controlled the water. There are enormous man-made moats around most of the temples that were used for defense, for agriculture, and as a symbol of the divine power of the king. I finally arrived in Thailand!